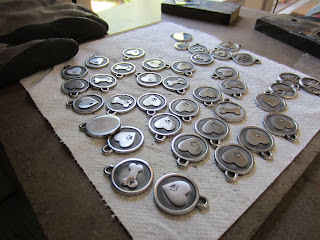 Pet ID Tags: Made in Maine Not China! Buy local, buy USA... it has a familiar ring these days! When buying local means buying higher price, those of us living paycheck to paycheck just don't go there for obvious reasons. However, buying local can sometimes mean buying smart, especially when you consider things like customer service, quality of product, and guarantees. Those of us purchasing for these values, have the added feel good bonus of knowing we supported a fellow American, perhaps even a neighbor! Its delightful and refreshing to be able to call a business and speak with its owner or an employee who actually makes the product. The chances of your order getting shipped quickly and customized to your specifications is usually greater if the product is produced here in this country. I receive email offers from Chinese companies every week. They want to produce mypet id tags much more cheaply than I do. US stamping companies that I spoke to when developing my pet tags urged me to get them made in China at a fraction of the cost. A major stainless steel pet id tag competitor of ours, who has a lion's share of the US market, manufactures their tags in China. The average factory wage in China is under $1.40 per hour at 12 hours a day, 6 days a week. Consumers who recognize the benefits of buying products made here in the US are key. Smaller companies, like my pet id tag business, have something to prove, pulling themselves up by the bootstraps, carefully monitoring competition, and striving for excellence in all aspects of their product. Our products float to the top because of you, the consumer. Buying products that last, support US jobs, and respect our health and environment, are sustaining for us all. So, the next time you are faced with the decision to buy cheaper from China or buy more expensive from the US, stop and think about the pros and cons. Who and what practices do you want to support with your dollar? What are your expectations for the durability of a product? What kind of service and warranty will there be after the sale?